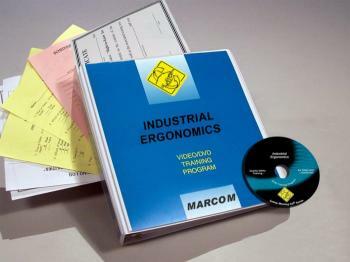 MARCOM's "Industrial Ergonomics" Safety Meeting Kit™ covers recognizing ergonomic problems, potential adverse effects and pragmatic solutions employees can use to address to these problems. In recent years potential ergonomic problems have become a major concern in many business environments. Many facilities are now devoting significant time and effort to controlling the twisting, turning, stretching and other motions that place stress and strain on employees' body. It focuses on potential ergonomic problems in manufacturing, assembly and warehouse situations. Materials in the kit include a video program, five motivational posters, and 30 employee booklets. The posters in the kit emphasize the importance of preventative measures. The videotape and employee booklets include information on physiology of the body, parts of the body most effected, eye strain, pragmatic preventative measures, correct use of office equipment, exercises and stress release, and more. The video program in the kit comes with a comprehensive leader's guide, reproducible scheduling & attendance form, employee quiz, training certificate and training log.